This entry was posted in Uncategorized and tagged Almost, Baggett, baking, Bread, cooking, food, Kneadless, Kneadlessly, Nancy, Simple by christao408. Bookmark the permalink. hahaha that is really weird timing, i had some beer to use up so i am trying out your bread recipe this weekend! it’s in the middle of the first rise now. @kunhuo42 – Spooky coincidence! Happy baking! Very professional looking, a success! I’d like to order some bread. I’m thinking that would be so tasty with a little garlic hummus and some shaved turkey and shredded parmesan cheese… or maybe pesto and cubed chicken with gouda… it makes my imagination go wild! Yum. Well, done I have had that at my sister’s place – she does the real baking. @christao408 – so i think i’ve been foiled by the weather again… it was much colder today than yesterday, and my yeast is not happy. i gave up on the first rise, and now the second rise is taking a really long time… i really should just wait until august when it’s 100 degrees outside hahaha. @kunhuo42 – But then that’s too fast. This is the biggest challenge with baking bread at home – no effective temperature control. I tell you, one of these days when I build my dream home it is going to have a climate-controlled kitchen with a proofing oven. @christao408 – that sounds wonderful! i’m in! 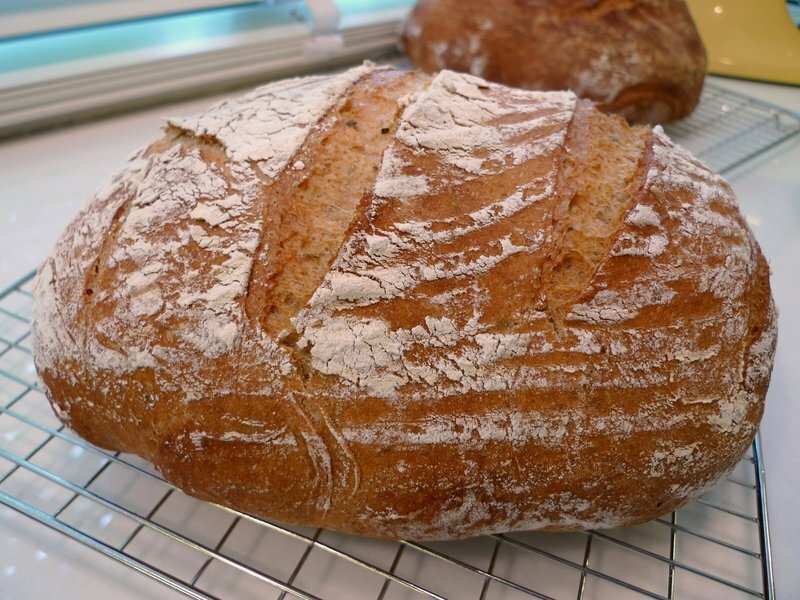 @christao408 – so i gave up at 9pm last night and baked my bread anyway even though it didn’t rise much. it didn’t come out too badly — not quite the right consistency, but decent flavor and not impossible to eat. i picked up more yeast at the store and will try again in a few weeks! @kunhuo42 – Aaron, I probably would have looked at the beer, looked at the recipe and just drink the beer instead. I enjoyed the video. This is gonna be tricky for me to make the bread. I will have to plan it over a couple of days. I noticed you also made granola and brownies too! @ElusiveWords – Yes, the video actually originally included mention of those items but I wanted to keep it to a single video and YouTube has a 10-minute limit. You don’t have to refrigerate so long, as little as an hour or two is fine. Also, the first rise doesn’t necessarily have to be overnight, either. Just depends on temperature. In general, more time is better than less in term of flavor development. If you increase the time in the fridge, you can decrease the time for the first rise. @kunhuo42 – Keep at it! @murisopsis – Cubed chicken, pesto, and pasta sounds great. I wanted to see you cut a piece, slather it with butter and eat it!